I spend a good portion of my life adventuring with my husband on his work trips to different corners of the world, stitching projects in hand; I would be lost without crochet! Before I hit the road, I get all my stitching in order. I select projects, organize my tools, and pack it all up for ease of access. I’ve learned how to ensure that I am connecting with fellow stitchers with whom I am able to recenter, laugh, and get creative while traveling. Organization is key while stitching on the go! I think I would lose my mind if I didn’t have any stitching with me, and likewise would find myself a little nutty without some key organizing - such as a safe place for all my tools, a method for keeping projects from unraveling or snagging, and easy access to patterns. I will admit that I am a little partial to the hook and needle organizers from Chicken Boots. Fun fabric aside, their organizers have a space for just about anything you can think of! Mine organizes hooks by size, has a pouch to tuck away a gauge tool, a pair of scissors, a tape measure, stitch markers, and a tapestry needle. This makes my heart pitter-patter with glee! They offer a variety of styles to select from for both knitters and crocheters; take a look around and see which version would be best suited for your needs. Make sure your project bag can hold the entire project: yarn, your needles/hook being used, your work in progress (WIP), and perhaps the pattern. You got that right, size does matter. I personally prefer bags that draw close to keep everything tucked away safe and sound. The draw string style also allows me to be able to work directly from the bag, keeping my “creation space” compact for cars, planes, and trains - no need to take the yarn out when you can pull from the bag! What happens when you don’t have internet? GASP! No internet?! It happens and it is best to be prepared. I usually bring a printed copy of the pattern with me, but if you prefer to remain entirely digital, most phones and tablets have the ability to store either a word document or a pdf file locally and not on a server or cloud that would require you to have internet access. This is a wonderful backup plan - download the file to your phone and away you go! If your phone does not allow you to save the file locally, consider taking screen shots of the pattern just in case. Starlight Knitting Society has inspiration in every corner! What I most enjoy about being able to work remotely is visiting yarn shops local to the area. I often will do a quick search online when I stop for food or reference the 2018 NeedleTravel Guide: Fiber & Fabric Mania. Picking up this book has been a huge help in planning yarn pit stops. They also have an online yarn shop directory that is handy to use on the go! 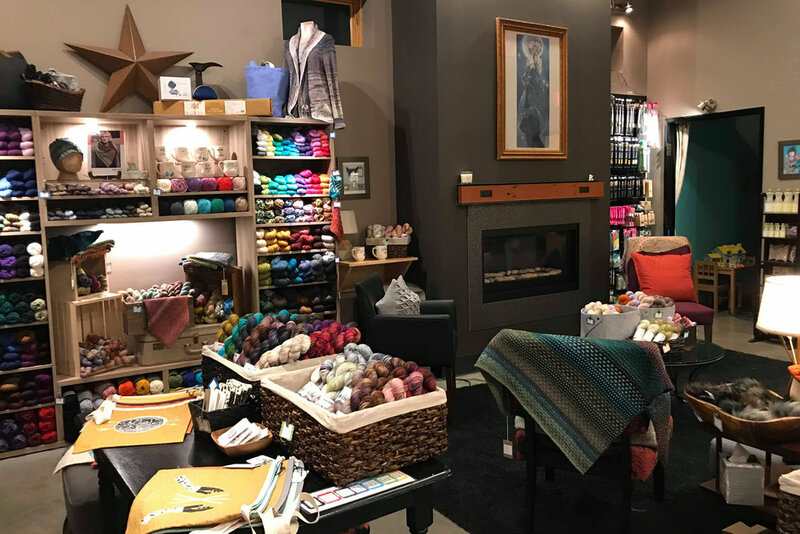 On a recent adventure, moving North from California to Washington, I had the pleasure of visiting an array of yarn shops in Oregon including: Cozy and Starlight Knitting Society. Each of these shops were welcoming, had wonderful areas to stitch, and (in my case) design. It was wonderful to meet new people and to explore yarns dyed locally. With more planning, I also like to work in Stitch Nights such as the one I attended at Cozy. This is such a fun way to break up the travel while socializing with unique people every time. I have found that many yarn shops list their community stitch time online, either via social media or their website, making it easy to plan ahead and attend one of their stitch times or events. Some projects are naturally easier to travel with than others, with limiting factors such as space required, transportation methods, and the complexity of the pattern. 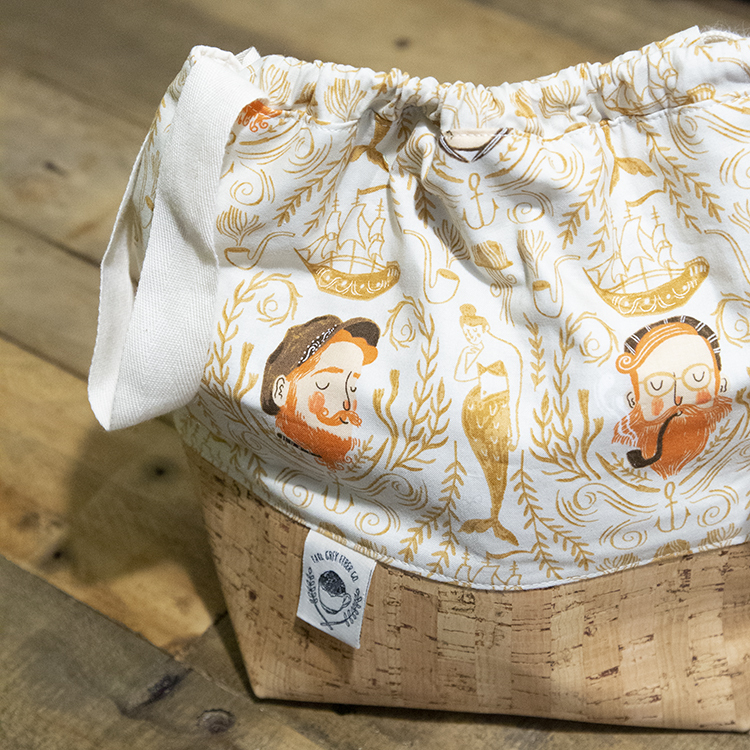 If your hope is to work on a stitching project on a plane or train, where elbows easily meet and people are inclined to converse with you - let’s face it, what you are making is freaking awesome - then a small, simple project is likely the best idea. I experience similar distractions at stitch nights and need “mindless” stitching to do at such gatherings where I also wish to chit-chat and be a part of the vibrant community. If you anticipate being holed up in a hotel room or chilling at a local yarn shop outside of their scheduled stitch days, then you could definitely consider a larger project that requires more focus. Plus, if you need any help with the project, most yarn shops are more than willing to help you problem solve a confusing instruction or a new stitch method!